Aaron Eckhart (The Dark Knight) portrays one of the most iconic horror legends of all time in the gripping adventure I, Frankenstein, available on 3D Blu-ray (plus 2D Blu-ray, DVD and Digital HD UltraViolet), along with DVD (plus Digital UltraViolet), Video On Demand and Pay-Per-View, May 13 from Lionsgate Home Entertainment. This film will be available on Digital HD May 2. From the producers of Underworld, I, Frankenstein follows Frankenstein's monster (Eckhart) as he becomes involved in a war between two immortal clans. Also starring Bill Nighy (Harry Potter and the Deathly Hallows Part 1, Pirates of the Caribbean: Dead Man's Chest), Yvonne Strahovski (TV's "Chuck," TV's "Dexter"), Miranda Otto (The Lord of the Rings: The Return of the King, TV's "Rake"), Jai Courtney (upcoming Divergent, A Good Day to Die Hard) and Kevin Grevioux (Underworld, Underworld: Rise of the Lycans), I, Frankenstein was written for the screen and directed by Stuart Beattie (30 Days Of Night, G.I. Joe: The Rise Of Cobra) with a screen story by Kevin Grevioux and Stuart Beattie. Based on The Darkstorm Studios graphic novel "I, Frankenstein" created by Kevin Grevioux, the 3D Blu-ray and DVD are packed with insightful bonus features including audio commentaries with Co-writer/Director Stuart Beattie and Filmmakers Gary Lucchesi, Richard Wright, James McQuaide and Kevin Grevioux, as well as two behind-the-scenes featurettes. 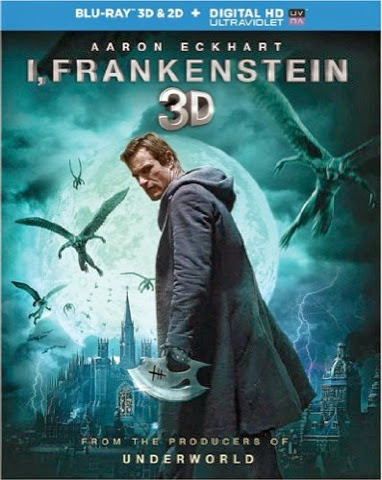 I, Frankenstein will be available on 3D Blu-ray and DVD for the suggested retail price of $39.99 and $29.95, respectively.